Undou-kai (sports festival, sports day) is a cliché material in anime and manga. It’s a big event in Japanese school. Undou-kai are usually held in September or October. Students make teams and compete against each other with such events as relay race, 50m foot race, three-legged race, piggyback fight, and so on. Some events are serious but others are fun! 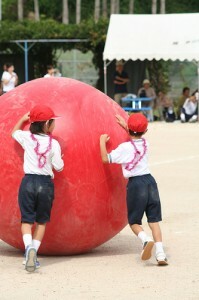 Bite-a-Bread race (called Pan-kui-kyoso) is a typical game in Undo-kai. It’s based on a regular footrace but the runner has to get one of the bread hanging in the course by his/her mouth and take it to the goal.